Now that I have been out of college for a few years (excuse me…months), it is time for me to start my career. I have kept up with this blog and have increased my posting frequency, because I have had more time. I have contemplated blogging for a living, and I have searched for jobs and clients. It has been hard, and I would love a career in digital media. However, I need to be realistic. I need to find a way to make money and to start my career sooner rather than later. In a way, it does feel like I have given up on a dream. Two dreams: blogging and music. But I like to look at it as finding a new dream. 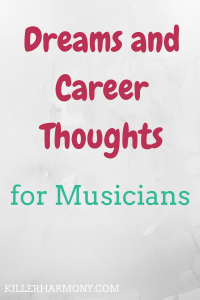 A dream that involves what I love about blogging and playing music, but not in those fields. I love working with people and communicating with others. Working with the public is stressful, but I do enjoy it. If I were to hole myself up at home or in some other office box, I wouldn’t be happy. That’s why I love performing; I get to be in front of people and to entertain them. The skills I have learned from my music degree and from this blog will transfer with me no matter where I end up. There are so many transferable skills in music, I even wrote a blog post about it. So I won’t list those skills here. This does not mean that I am going to quit blogging or quit playing music. We all need things to do in our off time, and I love having multiple things that fit that need. It means that if I don’t feel like playing flute one day, I can write a blog post. If I don’t want to write a blog post, I can play some music. I am still extremely happy with my decision to major in flute performance. It will not lead me directly to any sort of full time job, but that’s okay. I love being able to use this blog as a way to communicate other skills that I have. I can write and edit written content. I can create basic graphic images and can create templates for them. Blogging allows me to create content to educate people all over the world. I can speak to a bigger audience. The point is that I don’t plan on quitting any time soon, but it will probably become a hobby or a side gig. I have had to think long and hard about what I want to do now, and I don’t even know if I should publish this post. What I do know is that I want to work with others and to help or entertain people in some way. I love being able to make someone’s day, either by playing flute or simply complimenting them. It could be as small as helping a customer finish their errand a little bit faster. I know it sounds general, but working with people, and also with technology, is what I really enjoy. Yes, I am introverted, but I work well with others one on one or in small groups. That comes from my experiences in music school. So while I may not be able to pick out a single dream job, I do know what I want to do and how I work best. I want you reading this to know that it is okay for dreams and plans to change. We can’t plan for this kind of thing. I do plan to continue blogging about music, but I want to include more content that is relevant to amateur and semi-pro musicians. Music is a tough industry, and it can be a smart choice to keep music as a fun thing. Please take a look through the archives and if you have any questions that I haven’t answered, comment below and I would love to write a blog post about it (music or career related, of course). I know this isn’t the type of post I normally write, but I wanted to write it so that if you feel this way, you can get some sense of okayness. It can be very hard to set your dreams aside, but sometimes it is necessary in order to have a better life. Let me know what you think about dreams and choosing what to follow (or not). And don’t forget to subscribe for exclusive music tips and tricks sent straight to your inbox!